Teachers and students are becoming creators and publishers due to the possibilities new technologies provide. Traditional copyright can limit creativity, however Creative Commons and Open Educational Resources open up a new world of content to re-energise the possibilities when developing resources, and encouraging students to design new ways to demonstrate their learning. 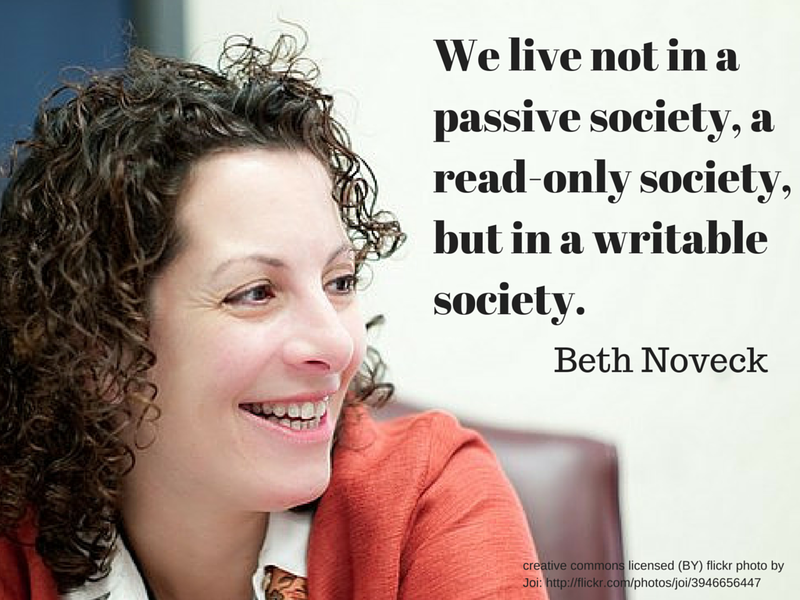 It used to be that when teachers and students created content, it could only be shared within the classroom walls. Today, the classroom walls are flattened, as we share resources and publish our learning to a worldwide audience. Not only do we have the ability to publish to the globe, students and teachers have unprecedented access to content which is easily able to be remixed, recreated and reused. We have come a long way from the days when scribes painstakingly handwrote copies of manuscripts. Now, Control C, Control V are the keys of power, and with a video camera on every phone, and free editing tools just a click away, students and teachers (and everyone else besides!) must be familiar with their rights as creators, and must also be aware of the need to respect others’ intellectual property also. Copyright, first initiated by the Statute of Anne in 1710, is a tool which aims to promote creativity, by protecting works from replication. As artists derive their income from selling their works, Copyright seeks to protect this source of revenue from being exploited by others. However, there are many that argue that in the internet age, Copyright is broken. While it is true that wholesale piracy and profiteering from the work of others must continue to be legislated against, the avenue of the internet as a forum for sharing, communicating and creating may be limited by stringent enforcement of Copyright regulations against those who do not seek to make commercial gain, but only to use others’ ideas and work as a part of their own creative expression. One of the strongest proponents of the need to seek changes in Copyright law is Lawrence Lessig, the Roy L. Furman Professor of Law and Leadership at Harvard Law School, and the founder of Creative Commons. There are some provisions within different countries’ Copyright laws that allow students and teachers to use some copyrighted material in the course of education. These provisions, which fall within Fair Use, Fair Dealing and Statutory Licences are useful, and should be taken advantage of; however they are only of use within strict educational settings. For those who wish to share their work more publicly, other options exist. One source of content which can be freely used is that which falls into the Public Domain. Once the term of copyright has expired (usually between 50-70 years after the death of the creator, although this varies internationally, and according to the type of work), it enters the Public Domain. The underlying idea of a work cannot be copyrighted, and therefore concepts such as mathematic and scientific formulae are also within the public domain. Content created before the existence of copyright also falls into this category. Some government agencies and public institutions donate their content directly to the Public Domain. Some of the most notable include NASA and the British Library. Content which is in the Public Domain is able to be freely used or remixed without any permission, although it is good practice to acknowledge the source. Fantastic examples of public domain remixes are everywhere – one to check out is the Tate Gallery 1840 Gif Party, where works were recreated as animated Gifs as part of a competition. See the results here. There are many sources of Public Domain images online; access a range of sites on my Pinterest board here. As rich as Public Domain content is, it is still limited by the length of copyright. A middle ground between Copyright and Public Domain is Creative Commons. Creative Commons is an effective way to source images, videos and documents while giving credit to the original owner. Creative Commons creates a “some rights reserved” model. This means that the copyright owner retains copyright ownership in their work while inviting certain uses of their work by the public. Creative Commons licences create choice and options for the copyright owner. Click to access the whole infographic. Click the image to go to Pinterest board. This makes it much easier to find Creative Commons Licenced content to use, remix and repurpose. A great place to start is the Creative Commons powered search, which enables you to search across multiple providers. However, for specific resources, check out my Pinterest board for lots of ideas of where to go to find more material. Another great resource are those put together by the wonderful people at Smartcopying, and Creative Commons Australia, who have just released excellent resources for educators. I have also written about this in more depth on the ResourceLink blog here and in the Copyright Copyleft Wiki I created in my role at Brisbane Catholic Education. Of course, you can’t go about using Creative Commons licenced material without clearly referencing it, and acknowledging both the creator, and the licence under which the work is released. Fortunately, referencing is simple, and this handy, printable (PDF) guide is excellent for providing examples and information. This wiki is also an awesome and easy to follow guide. To make it even easier, several tools exist to make referencing as simple as copy and paste. I have written before on the ResourceLink blog about the wonderful work of Alan Levine, who has created a tool for Flickr, which loads not only the reference, but also an embed code for any Creative Commons licenced image shared on Flickr. You can get the button for your bookmarks toolbar by simply dragging and dropping – read all about how to do it here. Another handy plug in is Open Attribute. By installing this extension into your browser (works for Firefox, Chrome, Safari and more), whenever the site you are on contains a Creative Commons licenced object, a CC logo will appear in the address bar. Click on this, and the text or html attribution will appear, for you to simply copy and paste. Although this only works for content that has been licenced with the machine readable code (find out more about the layers of a CC licence here), many pages include this metadata, and it sure makes referencing content easier! Wikimedia Commons is another phenomenal source of open content, and they too provide copy and paste referencing, known as the reuse assistance tool. Read this handy page on the wiki to find out more! Many believe that the high cost of textbooks and other educational resources are leading to the commodification of education, and that education should be free and accessible for all. By encouraging educators and other educational resource producers to share their work by either releasing it to the public domain, or by licencing it in an open way using Creative Commons, a growing bank of resources is being developed, so that everyone can share access to knowledge. This cause has many supporters, and resources can be contributed and accessed via a range of channels; some of the best known open educational resource repositories are listed on this Smartcopying page. The more educators are aware of these repositories, and contribute to them, the greater the availability of quality educational resources for all. 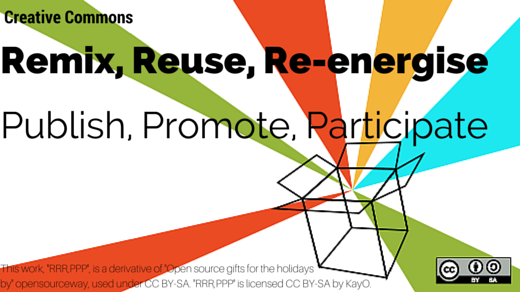 This work, “RRR,PPP”, is a derivative of “Open source gifts for the holidays” by opensourceway, used under CC BY-SA. “RRR,PPP” is licensed under CC BY-SA by KayO. This entry was posted in Communication, Copyright, Creative Commons, Design, Learning, Technology and tagged copyright, creative commons, digital citizenship, digital literacy, information literacy, intellectual property, OER, Open Education on March 16, 2015 by Kay Oddone.